I had always been the person that everyone turned to, the confident and the support system. I had a really hard time putting myself first and talking about my own pain with friends and family who often felt so comfortable divulging what they were going through to me. I turned to food as means of letting out how I was feeling. I used to hide food from my family, do separate grocery shops and eat in my room It took me a long time to realize how harmful this was and how I really felt about my life and my size. I tried to convince myself that I enjoyed my body. I had boyfriends who liked me but I still found it a challenge to look in the mirror. Today, my life is completely different I have lost over 17 pounds in 12 days! Health and fitness means so much to me. I eat clean, I work out several times a week and I feel great about where I am now. I would love to have my story posted and have the chance to help others with these struggles as I know how hard it can be to get started but how good it feels once you have. Good for you that you lost the weight! The hour-long jogs must have been difficult, 3 times a week. You have great will power and stamina. That is an awesome life changing story! I also struggled with food and depression. Are you still loving to keep up with your new found fitness life? I know what changed for me was when I started taking a martial art. I think it's really all about finding motivation. What's your motivation to continue exercising and healthy eating? This is great. Congratulations for your weight loss. You look very nice. Thanks a lot for sharing your story. It will inspire many people. How much weight did you lose overall? Looks like more than 17 pounds to me, You look great. enjoy the new you. Yeah looks like more than 17 pounds. Awesome job. I am trying to help my girlfriend lose weight. Wow!! 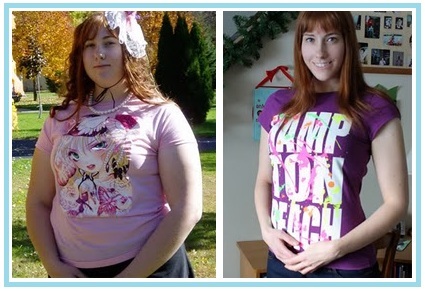 amazing your weight loss story. Your hard work has been possible to reduce the annual 1 day, 17 pounds. well come to your new life.